The defining feature of Capitol Reef National Park is the Waterpocket Fold, a monoclinal fold, or “wrinkle on the earth.” The wrinkle, in south-central Utah’s red country, is punctuated by crevices, cliffs, canyons, domes and bridges. A popular activity is to visit the Historic Fruita district. In the 1880s, early pioneers found that the soil in this region was great for planting fruit orchards, because of its proximity to the flowing Fremont River. Historic Fruita is the remnants of a once 200-acre frontier settlement. Here, visitors will encounter preserved historic barns, fences made with giant black boulders, a house built before the First World War known as the Gifford House, a one-room schoolhouse, and of course, the famed orchard. During the fall season, the orchards are filled with apples and pears ripe for the picking. This orchard is the largest fruit orchard maintained by the National Park Service. The NPS provides special fruit-picking ladders for visitors — climbing trees is prohibited. During the summer, the Gifford Homestead is open to the public. Formerly a private residence, the home has been renovated and is now a museum and country store. It sells freshly baked pies made with delicious, ripe fruit from the orchards. It also sells reproduction tools and utensils that would have been used by Mormon pioneers. Scenic drives are also very popular with visitors. The most popular, called simply Scenic Drive, costs $5 to enter. On this 8.2-mile road visitors will encounter the beautiful red rock formations and layers. The Moenkopi Formation is 225 million years old and gives evidence that it was formed when the area was once a moist, tropical climate. Another stop is Grand Wash. The landscape shifts from the red hills to steep, narrow canyon. At Grand Wash visitors will get a peak of Cassidy Arch, named for outlaw Butch Cassidy — it is believed that he used Grand Wash as a hiding place. The Capitol Gorge spur road is the next road on the drive, which is considerably more winding than Grand Wash. This road leads to the Navajo Foundation, which is 1,400 feet high in some places. The formation features white rounded domes that reminded early visitors of the nation’s Capitol Building — helping to inspire the name Capitol Reef National Park. The park is open year round. The Capitol Reef Visitor Center is open daily, but hours vary with the seasons. Check the website for current hours. The visitor center is a great place to pick up trail maps and brochures. It also features a video that helps to introduce visitors to the park. The park has no entrance fee. A fee is charged to only those taking the Scenic Drive. The fee is $5 for vehicles (cars and motorcycles), and $3 per individual on foot or bike. Passes to the Scenic Drive are good for seven days. Fruita Campground is the only developed campground in the park. Camping is first-come, first-serve and costs $10 a night. The campground has 71 campsites and a potable water station. There are also a couple of primitive campsites throughout the park, which feature picnic tables, fire grates and pit toilets, but no water. For serious hikers, backcountry camping is available, but requires a permit for overnight stays. Permits are free and can be obtained at the visitor center. 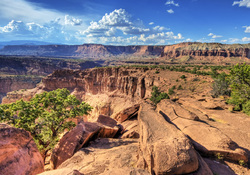 Popular backcountry areas include the Muley Twist Canyons, Spring Canyon and the Brimhall Natural Bridge. Capitol Reef National Park encourages visitors to submit checklists of the wildlife they’ve seen in the park. This helps to add valuable information to the park’s records. The mountain lion calls the Capitol Reef National Park home. Also known as cougars, pumas, or panthers, these elusive creatures are hard to spot — they are crepuscular in nature, usually creeping out at dawn or dusk. These predators feed exclusively on deer and other small animals. Deer are also common in the park. It is important that visitors do not feed the deer, since it encourages them to maintain a close distance to humans and campgrounds, in turn attracting mountain lions. Mountain lions can be very dangerous. Visitors should refer to the guidelines on the park’s website for tips and guidelines about dealing with mountain lions. Although the Waterpocket Fold area was the last area to be charted in the contiguous United States, people had been using the land for thousands of years. Ancient cultures used the area to farm squash, beans and corn. The area wasn’t mapped until 1776 when two priests passed through the area with the hopes of finding a route to missions in Monterey, California. The area first gained national attention when Ephraim Portman Pectol, a Utah state legislator, began a promotional campaign with his brother-in-law. The two sent photographs and stories of the narrow canyons in the Waterfold Pocket area to Washington, D.C., where support was drummed up for protecting the land. In 1937 President Theodore Roosevelt, an avid conservationist, set aside over 30,000 acres of the area as a National Monument. In the 1960s, national park tourism was on the rise, so the monument received additional infrastructure. After the construction of the paved road through Fremont River canyon, visitation rose to about 150,000 people per year. This renewed interest spurred two bills, which in 1970 were introduced to Congress with the aim of making Capitol Reef a national park. A year later, President Nixon officially established the park. 1880 – Nels Johnson, an early settler, plants the first orchards of apples, peaches, pear, plum and walnut trees in the area. 1928 – Ephraim Portman Pectol begins sending photos and stories about the Waterfold Pocket area to Washington, D.C.
1937 – President Theodore Roosevelt establishes Capitol Reef National Monument. 1950 – The first superintendent, Charles Kelly, is appointed to Capitol Reef. December 18, 1971 – Capitol Reef National Park is established. Click to see a detailed Capitol Reef National Park map.